It's been some time since we here at Trail Rider had a chance to swing a leg over Suzuki's championship-winning RMX. Quite frankly, since the RMX has remained largely unchanged since its 1989 debut, it was hard to get excited about yearly refinements and BNGs. 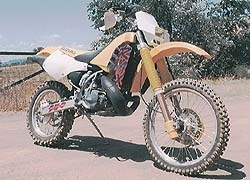 For 1996 however, Suzuki has done considerably more than improve an existing, albeit competitive off-road line. 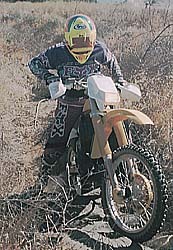 For one, the entire 1996 RM based line, including the RMX, have followed KTM's lead in the return to conventional slider forks. Fine twin chamber units are used on the RM, while the RMX gets a unique conventional slider cartridge-type fork. To cut to the chase, this fork works good, at least as good as the new Marzocchi units. On top of that seemingly earth-shattering news from Japan, front end changes are just the tip of the iceberg on the RM250. It turns out, the '96 RMX lags along with minor updates to last year's engine, while the '96 RM gets a truly new motor right down to the cases. It used to be that when you wanted to hop up your RMX, all that was required was a little browsing through the same year RM parts fiche. This is not the case for Suzuki's '96 quarter-liter offerings, as you'll have to revert to the '95 RM parts bin for help. However, look for the '97 RMX follow suit with the new motor that includes dimensional changes (longer stroke), cylinder reed induction system (vice case reed), an improved water pump design that moves the pump and impeller within the cases for better crash protection, completely redesigned clutch actuation linkage and a fully removable subframe. Commence salivating. Any way, enough history. The new fork is enough to stir our interest, and with a little help from local dealer Taylor Toussaint of Mt. Holly Suzuki/Kawasaki, we secured a fresh from the factory '96 RMX, and carved out a test session with the aid of a couple of local test riders: enduro wunderkind John Robbins and pro MXer/off-road hero Joel Dengler. The '96 RMX comes well-equipped right from your dealer, for either off-road racing and/or trail riding; perhaps even a bit over equipped. We're talking here about the EPA legal exhaust system that includes a clunky double-walled pipe and heavy, power sapping steel silencer/spark arrestor. Rounding out the annual RMX performance strangling, the airbox is capped with a bulky cover/induction snout. Nothing new here. On a more positive note, the new conventional slider front end is graced with bellows-type fork boots (while the RM comes with roost guards), complete with plastic fork underhang guards, and a front disk protector as well. Enduro goodies like a mechanical odo, a wide ratio five speed transmission, heavyweight flywheel, plastic rear disk and caliper guards, an o-ring chain, three gallon fuel cell, lighting coil, headlight and tail light, leave woods hounds little to howl about. From a maintenance and reliability viewpoint, zerk fittings are found on all rear linkage pivot points, and a new, RM-esque, two ring piston graces the engine. Rounding out the package, cast foot pegs that replicate (in looks, anyhow) expensive works pegs machined from billet stock bolster this important rider interface. In a nutshell, this bike is loaded. For our riding session, we left the RMX totally stock, and made no changes to jetting, suspension, or exhaust hardware. The motor proved an easy starter, even in the 40 degree temperatures of late November. With the choke on, it maintained a steady idle during warm-up, although it might have hinted of richness and the potential to load up. Warmer temperatures would likely demand a turn of the airscrew or otherwise leaner jetting, which should be no problem on the familiar Keihin PJ38 carb. For initial suspension setup, the fork compression adjusters were set at 13 clicks out from full hard and had an advertised range of 18. Interestingly though, we counted the adjustment range and only came up with 15 clicks. Similarly, fork rebound was set at 12 clicks from full damping while the advertised 18 rebound detents conflicted with our 23 clicks measured. Out back, shock compression was set at 14 clicks out from full hard (range 21 clicks advertised, 25 clicks measured) and shock rebound set at 12 out from full damping (range 21 clicks advertised, 26 clicks measured). Unfortunately, we didn't remember to check the sag until out on the trail. Afterward, when we did get around to measuring it, the sag (with our sorry, middle-aged butts on the saddle), was found to be a soft 120mm. Had we had more time, we would have liked to crank the sag down to something closer to 100mm and go thrash some more. No doubt this would do nothing but improve what was found to be already fine suspension action. Without any hand protection other than the stock hand guards, our tight woods work was severely limited. However, it was apparent that this is where the '96 RMX would excel, with lively low end power and a good linear power band. Of course, whenever the terrain opened up, the motor either required incessant clutching or just signed off. The stock motor just plain loses its breath at higher speeds in open country. Fortunately, the clutch pull is hands down the lightest in the business. A credit to the Suzuki engineers, it's amazing that a clutch pull this light doesn't lead to chronic slippage problems. After a very short period of riding the bike bone stock, we made our only change of the afternoon, discarding the airbox lid. This immediately improved motor response, especially in the transition from low to mid range. Not to say that it is comparable with other 250cc enduro bikes in this trim, but it does suggest that completion of the transformation (a.k.a. delegalization) would leave few riders jonesing for more ponies. This well known parts replacement drill includes an aftermarket pipe and silencer for more midrange and top end, coupled with a switch to a thinner RM head gasket which raises the compression ratio to boost low end bark. Everybody who races an RMX does this switch, and it is a completely different bike with the high-performance parts installed. The suspension set up as above was most plush, down in the comfy chair range. Initial compliance was such that the fork would easily react to the smallest of bumps, roots or sticks. This made woods work a cinch, allowing tree threading without fear of deflections. Despite this apparent softness we could not bottom either end, even with Dengler showing off his MX bag-o-air tricks. 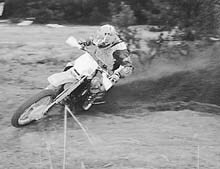 Likewise, the RMX managed sand whoops competently, without any unwanted kicking or swapping, and proved to be plenty stable at speed. If we could cite one complaint, it was a slight tendency to dive into turns. We attributed this to a little lightness on the fork compression damping, perhaps compounded by the improper sag setting out back. Surely a sag readjustment coupled with some fiddling with the fork compression damping would take care of nearly any complaints. 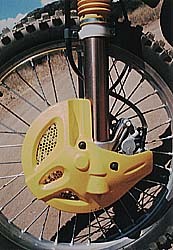 Bulkier riders, however, might have to consider heavier springs, whereas lighter riders might find everything just fine. If you're familiar with KTM's Marzocchis, the RMX fork is much more compliant than that fork during the initial hit, yet retains significant bottoming protection. Bottom line, the new conventional slider fork works great, and are well matched to the rear shock action. No doubt, the '96 RMX will provide an able working package that few riders could complain about. The '96 RMX will likely be the final year of this, the first generation of the model line. Characteristic throughout that run, this year's RMX continues to provide a well suspended platform in EPA legal trim. Top racers will no doubt loathe the compromises to quietness, and the resulting added expense of aftermarket pipes, silencers and RM head gaskets. However, any level-headed rider would agree that quiet should be the default, rather than the other way around, in today's political climate. 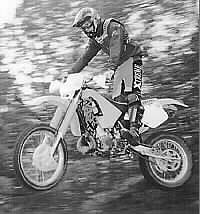 If you want to leave it stock, the '96 RMX provides spirited performance, more than adequate for trail riding, that should prove plenty competitive in nearly all novice or intermediate class contests. Either way, the RMX can be easily molded into a top performer.